Alumni and former students are able to retain their email account for a certain amount of time, as well as opt-in for an alumni account. Details and other helpful pages below! Alumni and former students are able to access their MyHusky account after leaving the university. MyHusky can be used to order transcripts, pay bills, retrieve copies of 1098T tax forms and other similar activities. IRS Form 1098-T's are supplied to students from the Bursar's Office. These forms reflect qualified tuition and related expenses that were received by BU on your behalf. A support page is available that shows full information about the 1098-T forms and what to do if you have not received one. 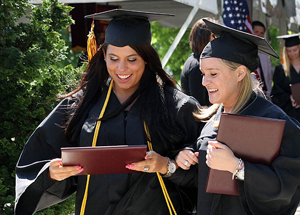 Alumni and former students who attended Bloomsburg University between Summer 2008 and the present time are able to access their MyHusky account to order transcripts. Students who attended prior to Summer of 2008 need to submit a paper form to the Registrar's Office.